Just when you thought you were doing tricks properly, this DVD came along to set you straight. 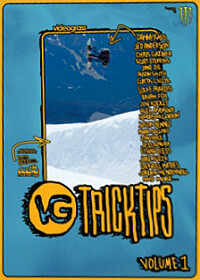 Not only will you learn how to do the most fun tricks in snowboarding, you will learn to do them pure and proper. All areas are covered here, from the simple Ollie, past the 360, and on to backflips and backlips. After watching this video you will be ready to hit the park and amaze your friends with some stylish moves done just like the pros. From Mt. High, to High Cascade Snowboard Camp, to the city streets, and mountain's powder, this group of top notchers will run you through the ins and outs of the best tricks of today. Learn the dos and donts along with some magician's secrets. Keep your tricks clean and you will be well on your way to Olympic Stardom or even better - filming a quality video part of your own!